BS Business Management / marketing / Engineering graduate; Preferably 1-4 years experience in Sales / Technical; Has strong interpersonal and negotiation skills; Experience in Sales is an advantage; Knowledge with MS Office Application and Presentation; Knowledge with Electric Vehicle is an advantage; Willing to travel; Preparation of itinerary and documentation. Female; Bachelor’s Degree in any field; Must possess good and effective communication and interpersonal skills; Good in administrative writing and reporting; High detail oriented and organized in work; Ability to meet assigned deadlines; Proficient in Microsoft Office Applications; Relevant work experience is an advantage . 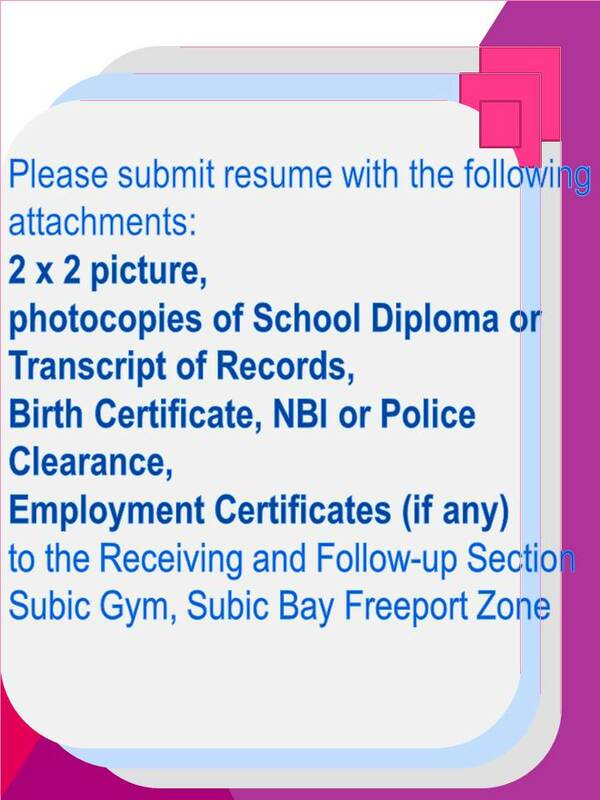 **PA SUPPORT SUBIC LTD., INC.
College Degree of any course; Computer literate; Excellent communication skills in English both oral and written; Good communication and interpersonal skills; Detail-oriented, independent and ability to manage multiple tasks effectively; With or without experience. Must be graduate of BS Marketing or similar; At least minimum of 1 year experience in procurement process; Can work under pressure and less supervision. Male / Female; Certified Public Accountant (CPA); With experience in General Accounting; Computer literate; Hardworking and can work with minimal supervision; With good oral and written communication skills. Male / Female; Graduate of Bachelor of Law; Having at least 3 years’ experience in labor consultancy jobs; Must possess strong personality; Proficient in MS Office, excellent oral and written communication skills; Willing to be relocated in Subic or Olongapo City, Zambales. Female; Graduate of any 4 years course; With administrative / clerical experience is an advantage; Computer literate; With good interpersonal skills; Fresh graduates are welcome to apply. Male; At least High school graduate; With Professional Driver’s License with restriction code #8; With solid experience in operating forklift and/or trailer equipment is an advantage; With TESDA Certification is an advantage. Male; At least High school graduate; With TESDA Certification is an advantage; Physically and mentally fit to work; Willing to be relocated in Subic or Olongapo City, Zambales. Female; Single / Married; With experience in Retail Store or Restaurant / Fast Food operation. Applicants are advised to register at the Receiving Section, Subic Gym on/before OCTOBER 20, 2017 before proceeding to the American Hardware Co. located at Bldg. 1136 Palm Street, Subic Bay Freeport Zone, from Monday to Friday, 11:00am – 12:00noon and 3:00pm – 5:00pm and look for MR. HENRY SANCIANCO. Male; Skilled Lathe Machine Operator. Master’s Degree holders (Master’s in Public Administration, Master’s in Business Administration, Licensed Customs Broker, and Master of Arts in Education); BS Entrepreneurship, BS Customs Administration; BS Technical Teacher Education Major in Food Service Management, BS Travel Management, Associate in Computer Technology. Bachelor of Secondary Education Major in Filipino graduate; LET Passer. Bachelor of Elementary Education graduate; LET Passer. Bachelor of Science in Accountancy graduate; Fresh graduates are welcome to apply. Female; Single; Candidate must be a Registered Nurse; Certified IV Therapy Nurse is an advantage; At least one(1) year working experience in the related field, preferably specializing in Healthcare-Nurse / Medical Support and Assistant or equivalent; Good in oral and written communication skills; Able to work under pressure and with minimum supervision; Slim and with pleasing personality. Male; College level or experienced employees specializing in Security / Armed Forces / Protective Services or equivalent; Knows how to drive and with driver’s license; With good moral character; Able to communicate effectively; Have at least 1 year experience in the same field under Hospitality industry; Should display excellent leadership skills and can tactfully convey the company’s security concerns with persons within and outside the organization; Knows how to drive is an advantage. Female; Graduate BS Accountancy or any course; Must have good communication skills (Filipino and English); With at least 2 – 3 years experience in the field; Possess good moral character. Graduate of any Engineering course, preferably BS in Electronic and Communications Engineering; Preferably with experience in new product set up and other engineering tasks in an electronics manufacturing company; Must be computer literate; Has good verbal and written communication skills. Male / Female; Graduate of any Engineering course; Preferably with at least 1 year experience in Quality Assurance of a manufacturing company. NC II or Vocational Diploma in Food and Beverage Service is an advantage; Willing to learn new information; Physically and mentally fit; Can work for long durations of time; Can withstand work pressure; Team player; Friendly, courteous, cheerful; Active listening and effective communication skills both Filipino and English. Any College level Education or Vocational course; Can lift heavy objects alone; Willing to learn new information; Can withstand work pressures; Must be physically and mentally fit; Can work for long durations of time. Male; 3 years’ experience as a Rigger; Must be able to work with minimum supervision; Must know how to handle heavy lifts; Know how to splice all kinds of ropes; Know how to handle all kinds of steel; Know the safety rules of rigging; Know how to signal to the operator of cranes. Male; Minimum of one(1) year related experience; Vocational graduate with skills in A/C and Electrical works; Physically and flexible; Can work under pressure. BS Accountancy graduate; Fresh graduates are welcome to apply; Knows how to drive and with driver’s license. Female; Graduate of BS in Accountancy or equivalent; With 1 – 2 years relative general accounting experience is required; Familiarity with bookkeeping, bank reconciliation, accounting procedures and statutory reporting compliance; Well-versed in the use of MS Office and other windows based programs; Accuracy, aptitude for numbers and attention to detail; Well organized and trustworthy; Fresh graduates are welcome to apply. Female; Single / Married; At least high school graduate; With work experience as Factory Worker. Male; Graduate of Degree Automotive Mechanic course / Automotive Servicing NCII passer (TESDA); At least 6 months to 1 year experience in the same field; Has basic mechanic skills.